Improving the quality of life is considered a central goal of palliative care, together with the prevention and relief of suffering. 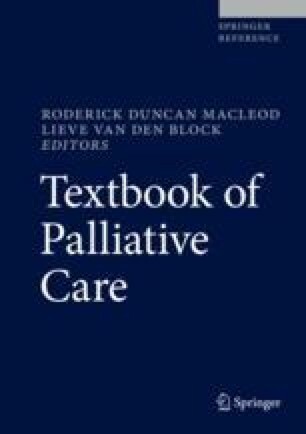 However, there is no broadly accepted definition of palliative care. Quality of life may be defined as the gap between expectations, hopes, and ambitions and the present experiences (Calman gap). With progression of the underlying disease, and deterioration of physical and cognitive performance status, patients may still report good quality of life, if they reduce their expectations or shift the focus to other areas to find quality of life (response shift). However, patients experiencing rapid progression of severe illness may be overwhelmed with the next steps of deterioration, and may not be able to adapt their expectations quickly. Using quality of life measures as a primary outcome parameter for palliative care may be difficult, as there are so many things that affect it that have nothing to do with the provision of palliative care. Economist Intelligence Unit. The quality of death. Ranking end-of-life care across the world. 2015. Retrieved 3 Jan 2016, from https://www.eiuperspectives.economist.com/healthcare/2015-quality-death-index.